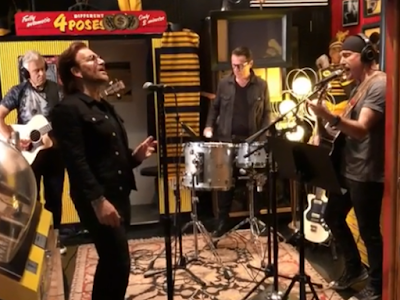 U2 recorded a live, stripped-down performance of their current single, "Love is Bigger Than Anything In Its Way", at Jack White’s Third Man Records headquarters in Nashville, TN on May 27, and video from the session is streaming online. U2 stopped by the studio the night after they played in town at the city’s Bridgestone Arena as part of their current Experience + Innocence tour, which opened in Tulsa, OK on May 2. "It's really great being in Nashville," said Bono just after recording. "People are really good to us. And then [Third Man Records] is such a temple, you know? To music."